Faces of the World Inc.
"What I most appreciate in Stephen's art is his ability to express and bring light to a face, by his play with colors. For our friend, Stephen, a face is a treasure!" Stephen Bennett's dream to be exhibited in the United Nations Visitor's Lobby came true in 2007. The Exhibits Committee requested 17 portraits to enhance an exhibit of Indigenous Cultures. 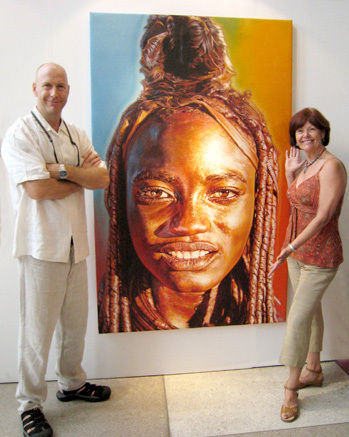 Representative, Victoria Graham joins Stephen in front of "Himba Super Model" (Namibia 2002).